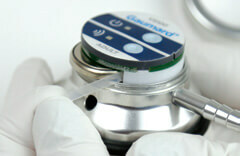 The amazing technology that simulates the various heart and breath sounds is hidden within the stethoscope bell itself. There are no bulky boxes or transmitters, making it easy to use and realistic. Simply press the bell against the simulator’s skin at the correct anterior or posterior auscultatory site and listen to the corresponding sound. The VS100/VS105 include a reference key card that indicates the auscultatory sites locations and the sound types available. Additionally, the package includes a set of optional loud speakers useful when teaching an audience. This continuous murmur may be found in children aged 3 to 6 years. It occurs as a result of the turbulence in the jugular venous system and it only heard when the child is in the upright position. The rate is about 96 beats per minute. This systolic murmur is loudest over the ascending aorta. Duration and intensity vary with the severity of stenosis. An ejection click may be heard. Sounds are rather normal. Degree of splitting increases with the inspiration and decreases with the expiration. Wide split suggests prolonged RV ejection or shortened LV ejection; narrow split suggests early closure of pulmonary valve. This systolic murmur is normally loudest over the main pulmonary artery. Duration and intensity vary with the severity of stenosis. Fixed S2 does not change width during respiration. The absence of split S2 usually indicates a condition that prolongs RV ejection time or shortens LV ejection. Conditions include volume/pressure overload and RBBB. Normal heart sounds heard in a 1 y/o child. The rate is 120 bpm. Normal heart sounds heard in a 6 y/o infant. The rate is 84 bpm. The vibratory murmur may be found in children between ages 3 to 6 years and sounds like "twanging string", or squeaking/ buzzing at a low frequency. During inspiration, murmurs increase on the right side and decrease in the left. This systolic murmur is produced by lesions, more often rheumatic than congenital in origin. Chest ï¬lms may show pulmonary vein congestion, pulmonary edema, or an enlargement of the left atrium/ventricle. S1 relates to closure of mitral and tricuspid valves. Not common in normal children, and may indicate RBBB or other anomalies. Sound can be confused with an ejection click S4. Expiration sounds are louder, have a higher pitch, and are of longer duration than during inspiration. The silent period or pause following expiration is longer than the one between expiration and inspiration. Patient has marked respiratory distress, and a narrow aperture between the vocal cords that produces a high pitched tone during both inspiration and expiration. During the end of expiration, there is an abrupt drop in pitch. These musical wheezing sounds are often heard in asthma patients. During inspiration, the wheeze is slightly higher in pitch than during expiration. Wheezing in asthmatics is often present in either one or both phases of respiration. Coarse crackles are present during both inspiration and expiration. There are also some very low pitched repetitive sounds that are ronchi. High pitched squeaks are also audible against a background of bronchial breath sounds. Unscrew the top cover of the stethoscope bell. Remove and discard the plastic insert separating the two batteries prior to first without use. after 6 minutes of inactivity or after 40 seconds of looking for a sound without success. Press and hold the button for 2 seconds to begin selecting the desired sound set as per the “VS100 SOUND TABLE" to the left. Press the button briefly to cycle through the different sound set colors. Press and hold the button for 2 seconds again to hide the selected color. 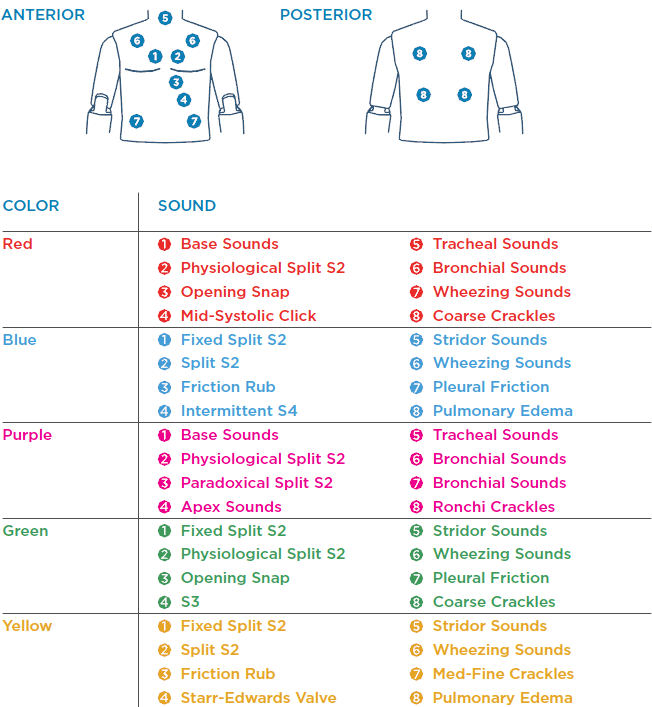 Press the stethoscope firmly against the auscultation areas to listen for sounds. 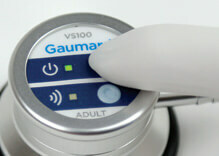 If the stethoscope is pressed against non-auscultation areas the indicator lights stop blinking. 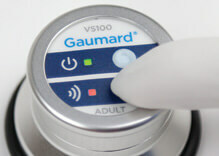 The VS100 Virtual Stethoscope uses two CR2032 batteries (8 replacement batteries are included). To replace the batteries, unscrew the top cover of the stethoscope bell. Pull the battery removal strip outward to remove the batteries. Insert two new batteries, positive (+) sides facing down, taking care to relocate the battery removal strip in its proper position. Replace the top cover of stethoscope bell.